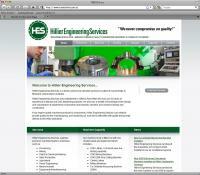 I would like to convey our total satisfaction with Trent Moffatt Designs in designing the new Hillier Engineering Services website. The professional advice and ideas that TMD came up with were outstanding. The entire project ran very smoothly and on time which was very important to us. We are very pleased with the end result and I would highly recommend TMD to anyone looking to have a website designed and implemented. Thanks very much Trent. It has been a great pleasure doing business with you and your company.